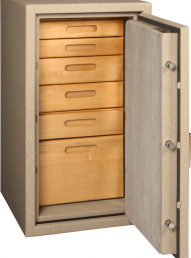 The Storit 4 Drawer Safe Cabinet by Amsec stores your valuables in style. The Cabinet includes 4 different jewelry organizer trays lined in attractive red felt. The handle is recessed to allow for a snug fit. The cabinet is made from solid-wood maple drawer fronts and maple veneer and finished in a honey maple stain. The Top Drawer has one Three Compartment Ring Organizer and one Seven Compartment Jewelry Organizer. The 2nd Drawer has one Three Compartment Necklace Organizer. The 3rd Drawer has one Four Compartment Watch Organizer. The 4 Drawer is left open for larger objects or additional Organizers.